GSTR-1 is a monthly or quarterly return to be filed by regular dealers. The return is divided into 13 sections. It might look complex but ClearTax GST Software makes the entire process of filing GSTR-1 seamless and easy. 2. Legal name of the registered person: Name of the taxpayer will be auto-populated at the time of logging into the common GST Portal. 3. Aggregate Turnover in the preceding Financial Year and for April to June 2017: Aggregate Turnover is the total value of all taxable supplies made (excluding the value of inward supplies on which tax is payable by a person on reverse charge basis), exempt supplies, exports of goods or services or both. 4. Taxable outward supplies made to registered persons (including UIN-holders): All B2B supplies should be mentioned in this section. 4A. 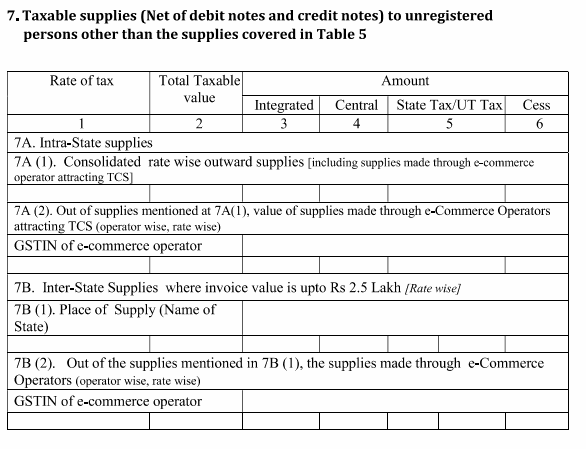 Under this head invoice wise details of all supplies made other than those under reverse charge and supplies made through e-commerce operator should be mentioned in this section. All type of zero-rated supplies, exports, deemed exports (supply to SEZ, EOUs) has to be mentioned under this head. A registered dealer has to give details of invoice, bill of export or shipping bill. 7. This section contains a rate wise summary of all sales made during the month. All the other supplies whether nil rated, exempt or non-GST which has not been reported under any of the above needs to be reported under this head. This need to be further bifurcated into Inter-State, Intra-State to registered and unregistered persons. 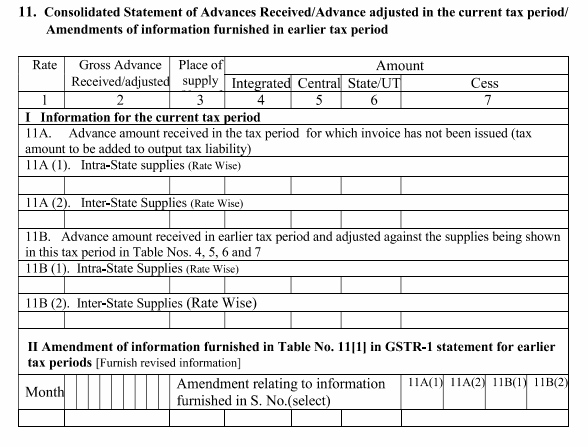 Any correction to data submitted in GSTR 1 of previous months can be done by filling in this section. The type of amendments covered here are with respect to B2B, B2C Large and exports. All debit notes, credit notes and refund voucher should also be entered here. All the above details with respect to Credit Debit Notes are based on the original Invoice which it is linked to, Hence these details must match with the details of the linked invoice. No Amendment can be made with respect to those invoices that are accepted or modified by the receiver of goods. 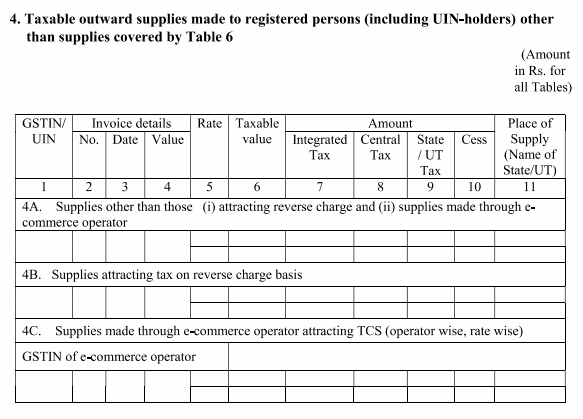 The reason is that those invoices will automatically get reflected in the GSTR-1 of the supplier in the month of such acceptance under the relevant amendments table. 1 B2B Amendments (9A) Amendments made in the invoices already issued earlier must be reported here. These are the invoices for taxable supplies made to registered taxpayers including supplies made to SEZ/ SEZ Developers with or without payment of taxes and deemed exports. 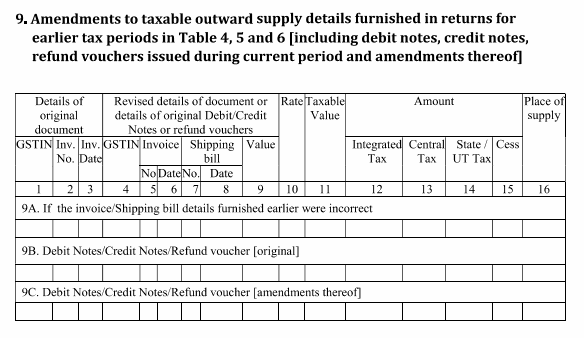 (9C) Credit or debit note amended against already issued Credit or debit note reported under B2B (i.e where supply is made to a registered taxpayer), will be reported here. (9C) Amended Credit or debit note issued against original Credit or debit note reported under B2C Large and Export Invoices section, will be reported here. (9A) Amended invoices issued against already issued original invoices must be reported here. 1. Export under bond/LUT-If you are exporting under bond or letter of undertaking and not paying IGST. 1 B2C Others Amendments (10) Amendments made to the invoices already issued earlier must be reported here. 11. Consolidated Statement of Advances Received or adjusted in the current tax period, plus amendments from earlier tax periods. Mention all advances received during the earlier period corresponding to invoices raised during the current period. 12. HSN-wise summary of outward supplies: This section requires a registered dealer to provide HSN wise summary of goods sold. 13. Documents issued during the tax period: This head will include details of all invoices issues in a tax period, any kind of revised invoice, debit notes, credit notes, etc. 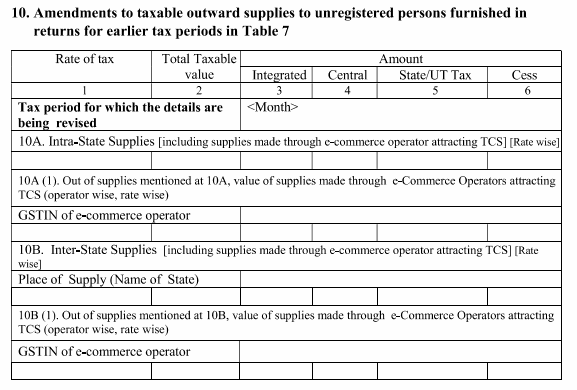 How To File GSTR-9A On The GST Portal? Common Errors made while Filing GST Returns & How to avoid them!